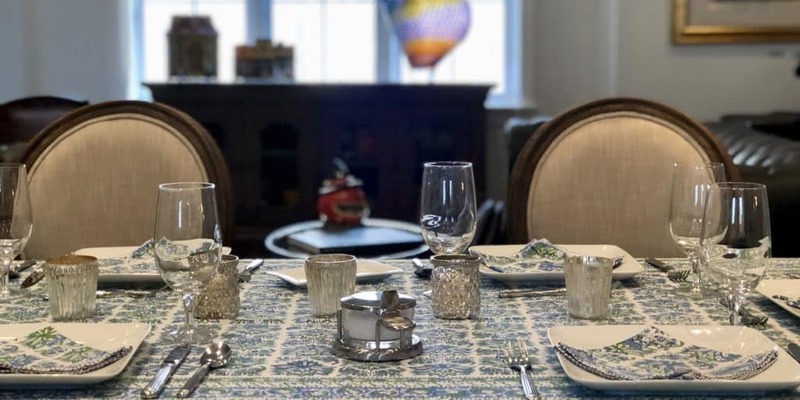 Part of the exercise of creating my own food blog has been to push myself a bit, both when it comes to learning how to become a better cook, as well as simply trying new foods that are not yet a staple part of my dietary habits. 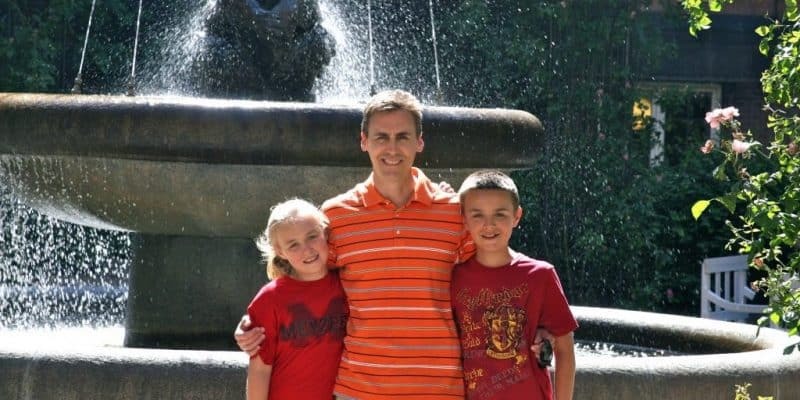 As I have grown older and become more knowledgeable, I realize that means that I should be eating more naturally occurring whole foods than I did in years past. And ideally, more plant based food than before. As part of my move towards culinary conscientiousness, I am now trying to find ways to include at least two or three servings of vegetables with each meal (breakfast not included!) Sometimes that is as simple as raw carrots and bell peppers, but other times I might lean more towards mashed cauliflower or roasted Brussels sprouts. Either way, my repertoire of cooked vegetables is pretty limited, and it seems time to branch out a bit, and try something new. And in my house, something new includes oven roasted beets. My wife has long enjoyed beets, ordering them almost whenever possible when eating out. Knowing this, it seems fairly inexcusable that I’ve waited this long to make them at home. 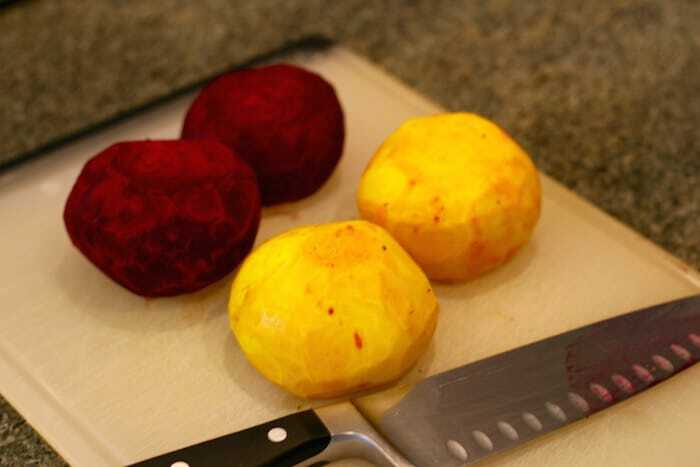 Perhaps I’ve been scared away by hearing rumors of how messy beets are, and how peeling them will stain your hands and anything that they touch. Or how incredibly hot and painful peeling them can be, if you roast them first, as many recipes call for. 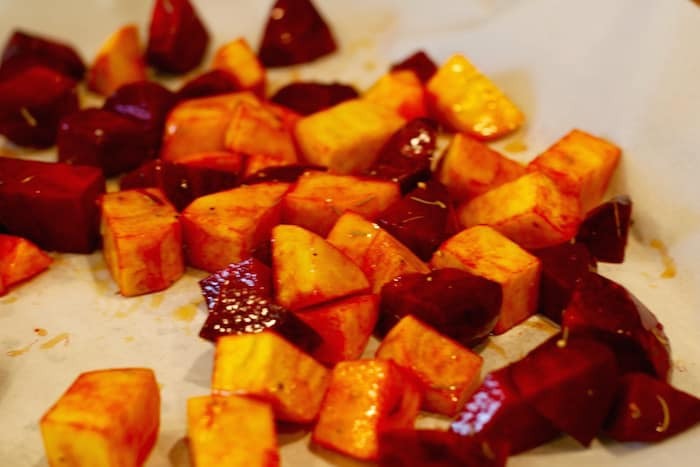 But it turns out that preparing oven roasted beets is super easy, and something that I should not have avoided for so long. 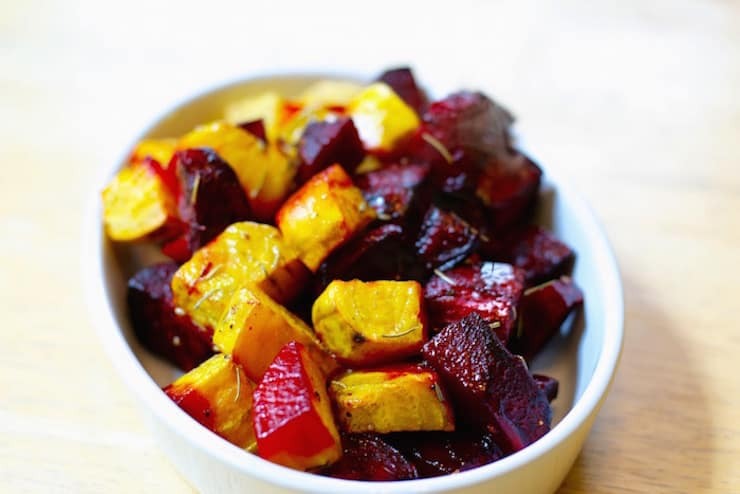 Trimming and peeling the beets before roasting them makes this recipe even easier! There seems to be a bit of a debate online about whether to peel before or after roasting, but for me, I’m squarely in the pre-roasting camp. 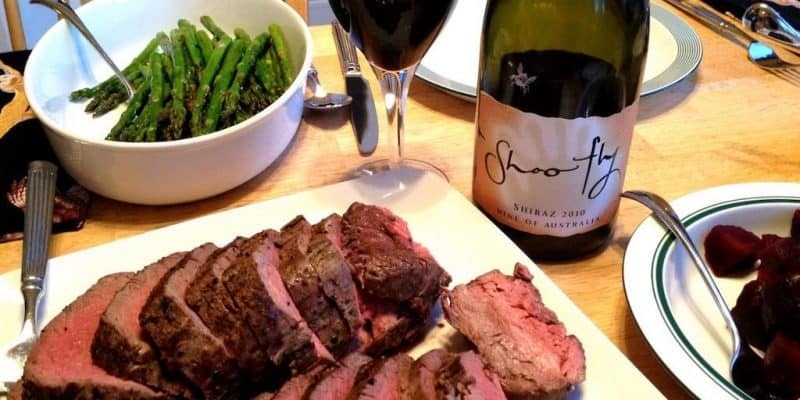 One of the benefits of most roasted vegetable recipes, this on included, is that there simply isn’t too much to think about in regards to the quality of ingredients, simply due to the limited number of necessary items. I took a quick look at the EWG’s Dirty Dozen list to see if beets were listed as some of the most pesticide laden produce items when bought conventionally, and they aren’t. So if price is a concern, this might be one recipe where buying organic is not as important as in some other cases. 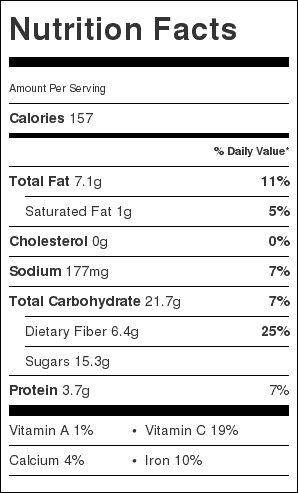 As with so many other recipes on this site, please don’t take this nutritional panel and assume that every single value is absolutely correct. 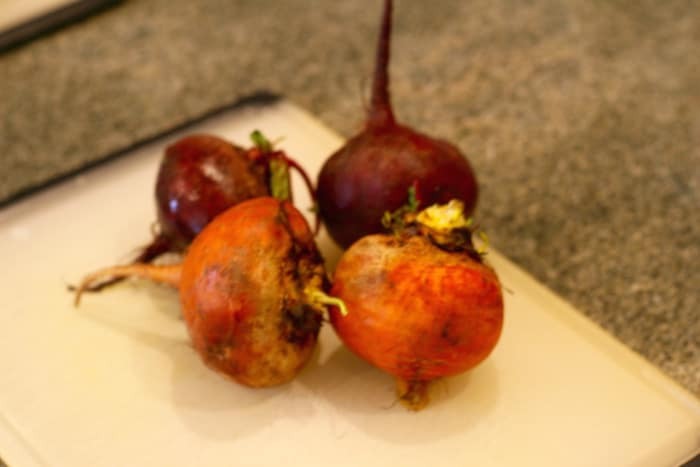 They should be close, but there’s no telling if our beets were the same size, did we trim as aggressively as each other, did I pour a little extra olive oil in, etc… as always, use these nutrition facts for roasted beets as guidance, and you should be fine. 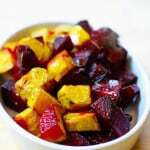 For this recipe, I bought four good sized loose beets, which weighed a few ounces shy of 2 lbs before I trimmed them up. Once peeled and ready to be chopped, I was probably close one pound and 10 ounces of beets, which we split into four servings.